Over the past week, I have been asking myself why I blog. This musing was prompted by several requests for recipes that I used in my previous post. When I first began my blog and named it with the most uninspired name possible, it was purely for the selfish reason of self-expression. Having made the great leap to professional pastry from ophthalmology, I needed to document this unchartered journey to an anonymous audience who would hopefully have some interest in experiencing the transition with me, whether from the medicine or food industry point of view. 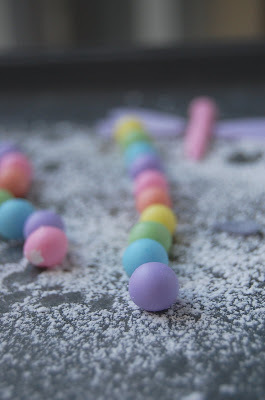 These days, as I am farther removed from my old professional life, I choose to focus my blog on documenting my own creative pursuits, through pastry and photography. I still view my pastry life through an atypical lens because, despite it being over three years since my departure from medicine, my observations are akin to those of a displaced clinician who has meandered into the midst of a pastry kitchen. More importantly, my comfort level in my new "skin" is stronger having shed some, but not all, of the insecurities which came from perceived judgement and negativity. Consequently, my blog will probably never become a mainstream food blog, filled with recipes and group baking activities, due to a conscious decision to concentrate on what inspires me and not to follow a particular format nor be instructional. Most of the recipes which I use or adapt at home are from unpublished sources and so I do not feel at liberty to send them into cyberspace. The whole question of recipe ownership intrigues me and I have yet to find a good discussion on this topic. Does changing one gram of an ingredient make it yours? 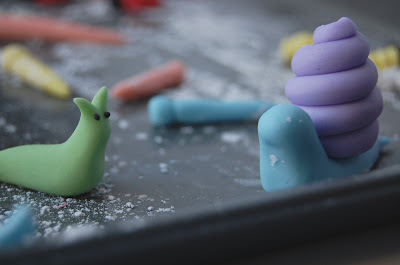 Meanwhile, these unfinished pastel-coloured fondant garden creatures are crawling around my countertops, soon to be assembled onto a rose garden themed birthday cake for a little girl named Rose. It was an opportunity to emulate the work of the talented cake designer at CakeJournal whose style can only be described as sooooooo cute. As a detail freak and former micro-surgeon, I am certainly in my element when making tiny things look perfect! Posted by Charmaine at 6:06 p.m.
July 17, 2008 at 8:25 a.m. I love these little creatures and your strong point of view even more. Keep on being yourself! Love the colors. July 17, 2008 at 8:39 a.m.
i admire you for sticking to your own blogging approach. and those little critters are cute. July 17, 2008 at 11:31 a.m. These creatures are so lovely. You're quite the artist. Can't wait to see the final project. July 17, 2008 at 12:34 p.m. Follow what you love. Don't worry about being the biggest food blog on the block. I LOVE these little creatures you dreamed up! They're absolutely darling! July 17, 2008 at 2:04 p.m.
July 17, 2008 at 4:20 p.m.
Holy cow, your little snails are adorable. I hope you'll post instructions on how you made those little swirls! July 17, 2008 at 9:43 p.m. I ask myself these same questions everyday. I started my blog with one focus, my self expression. Then I started to get into blogging events and such because I thought that was what I had to do to be a food blogger. I realize it is not an I am drifting away from that and refocusing on what inspires me. Regarding recipes ownership, I don't know all the answers but what I do know is that even the most successful pastry chefs borrow from others. And I think that's ok. They might take a recipe for a tart dough from an old pastry chef they worked for but make a new flavor of cremeux based on another cremeux recipe. I think when flavor combinations and aesthetics come into play, then there is some sort of ownership because that recipe combination and flavor combinations came from a particular individual and his/hers inspiration. I was talking to a fellow pastry blogger and this is how I put it. I said,... I see it as this. If I am walking down the street and I see a woman wearing a dress I like, I ask her where she got it and then I buy it for myself because I love it so much. However, I accessorize it differently, I do my hair and make up differently... Then did I copy her style? I don't think so. I know it's not the same but similar concept. I love how original and true to yourself you are with your blog. I appreciate when one focuses on their inspiration. July 18, 2008 at 4:38 a.m. Thank you everyone for all your positive supportive comments. I appreciate people who take the time to read blog content, think about it, and respond. It becomes more like a dialogue rather than just show & tell. July 18, 2008 at 7:58 a.m.
July 20, 2008 at 12:30 a.m.
Glad I find your blog through foodgawker. Your cake decoration is inspiring. July 22, 2008 at 7:51 a.m.
What a delightful cake! I shall be returning to your blog often...I like your style, honest, simple with lots of creativity. July 22, 2008 at 5:48 p.m.
Ooh I like your blog...love the pictures and style. LOVE the snails!!!!!!!!!!!!!! August 21, 2008 at 9:43 a.m. 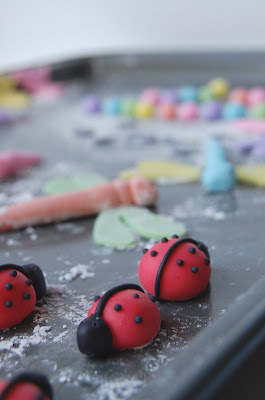 I really liked the cute little creatures that you made for this cake! :) I had just started experimenting with fondant and so far, youtube has been my faithful teacher. 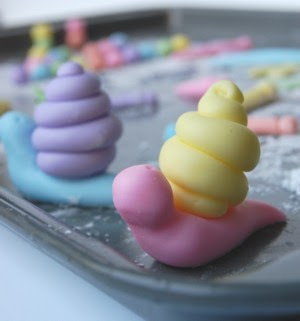 I'll definitely try to learn how to make these cute bugs and snails. February 18, 2009 at 2:49 p.m.